Arriving at tonight’s gig, the long queue outside signalled both that the venue was going to be busy, but also that a lot of fans had got here nice and early to make sure they caught the opening act – Taiwanese band Chthonic. At Download earlier this year they brought over a small Taiwanese orchestra to play with them and that sounded superb, but they had a very short set. Tonight they have a much longer set and are back to their normal style of playing, without the orchestra. 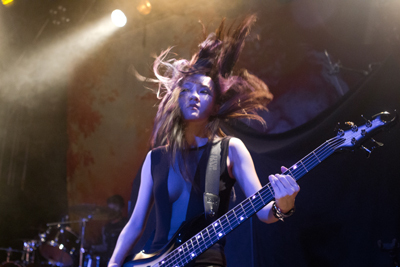 Chthonic have a refreshingly different sound to most metal bands as alongside the core of metal they use traditional Taiwanese music to combine with the metal and which gives them a distinctive sound. 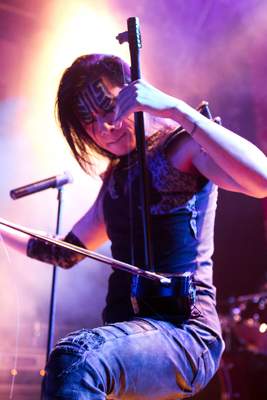 For a couple of songs tonight, singer Freddy plays a unusual looking instrument – a Chinese violin-like instrument called a Erhu or Hena, which as well as being visually interesting, produces an unusual sound that works well with their metal. When not playing this he puts in a great vocal performance. Bassist Doris may be a model, but watching the show it’s clear that she’s on stage because she’s a damn good bass player, and she’s clearly enjoying herself on stage as she headbangs and generally puts in a great performance. Add in a masked drummer, a bizarrely masked keyboard player and a guitarist and you’ve got a great band, and they go down well with tonights packed crowd. This was a great performance, and despite it being a much longer set than download, I could happily have watched a much longers performance – maybe next time they tour we might be lucky enough to get some headline shows. After the set they headed out to the merch stand to meet fans, sign stuff and pose for photos. As the stage is prepared for tonight’s headliner, the first thing that grabs our attention is Frost’s huge drumkit – the damn thing even has huge metal antlers! 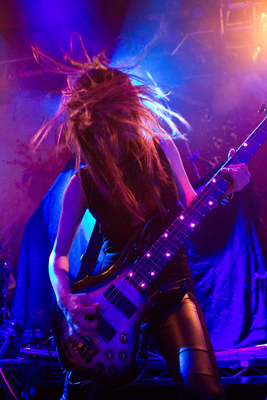 Equally impressive is Satyr’s mic stand – this isn’t a band that does anything by halves. When they hit the stage, then things just keep getting better and better. With Chthonic being a hard act to follow Satyricon have to be really impressive, and that’s exactly what they are tonight as they put in a superb performance. Their set covers material from across their back catalogue as well as the latest album and every song goes down well with the crowd as they put in a superb performance. Singer Satyr sometimes stands on the monitors and towers over the crowd and at other times uses his mic stand (which is more like a lectern) as a prop. An excellent performance. Two great bands played tonight and we got great performances from both – what more could you ask for. The packed crowd certainly enjoyed the gig.